QuickPic's best feature is that it's fast, and can completely replace the default Android Gallery app if you want it to. It doesn't have the transitions and flare that the default app does, but it loads images quickly, and if you need to resize, move, copy or hide images in your gallery, the app allows you to. Just long-press on any image to see all of the editing options available. If you have multiple images to resize, or you want to move several images into a new gallery, just select them all and tap the menu button or long-press on any one of them. 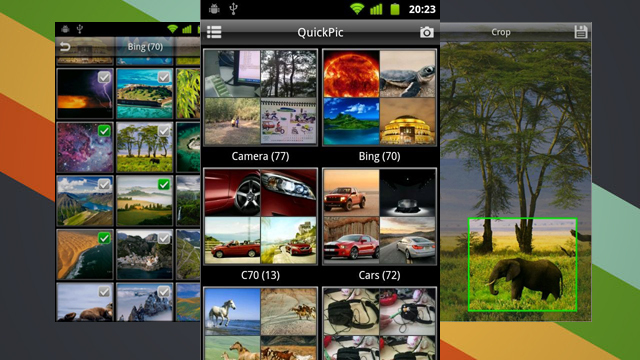 QuickPic is also a robust batch image editing tool, and gives you the ability to resize an entire gallery on your Android phone at once. Does this get around the annoying hires images issue? The only flare I want is if I engineered it into the pic when I took it. This app is hands down the best. Forget all the flare of transition effects and bla bla that slows down everything. Try using the default gallery of 2.2 on a tablet with over 10k images. It will grind your system down to a halt. No kidding - 10 min. to open the gallery, and another 10 to view the 200+ images in that folder. GREAT JOB. Thank you Developers.